Going back on vacation, I knew I needed to use some of the time to promote Freefall, but, since it is an ebook, it was a bit challenging. You can’t exactly schedule book signings when you don’t have the physical book to sign. So I went back to the basic principle of promotion, or what I call, Promotion 101—talk the book up, not necessarily myself. Tell just two people, then two more people, then two more people, and if you get them excited about it, perhaps they will tell two more people and so on and so on. But how to approach this without being rude? To start off, I had business cards made when Freefall was released. Very simply, on one side is a section of the cover showing a plane in distress with the title, Freefall,the tag, Sizzling Suspense from Susan Rae, and the QR code for my web site. On the flip side is a section of the cover of my first novel, Heartbeats, with the tag, 4 stars—RT Magazine, and my web address www.susanrae.com. On the golf course, paired with another couple, inevitably the question of one’s occupation comes up. 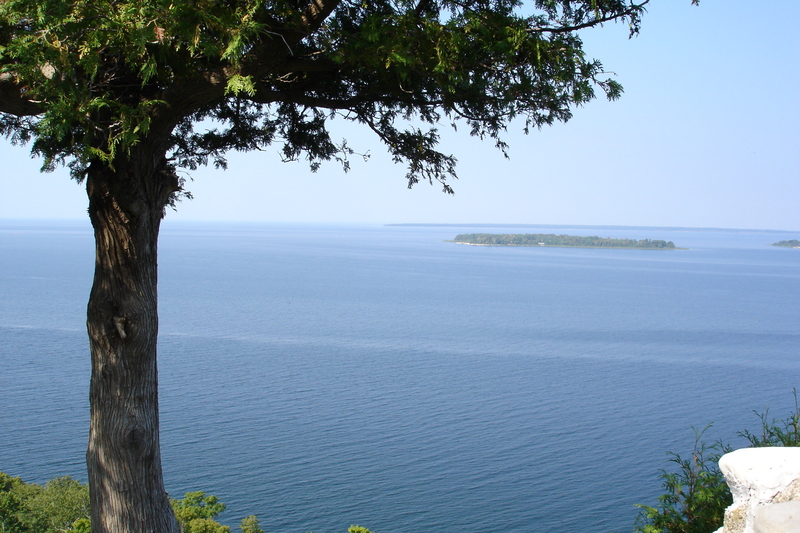 It was fun explaining that I was an author and that I loved the setting of Door County so much that I set a major portion of my recent book in Door County. This generally started very nice conversations because they also loved the setting, which is why they were there. I then handed them a couple of my cards and explained that I’m with ebook publisher Musa Publishing and that the books are available at Amazon and all major ebook retailers. I was able to expand this approach to anywhere people were enjoying the scenery: at the overlooks, on the beach, on the bike trails, even in a couple of the shops my husband and I visited. It also helps when you are interested in what they are selling, too, which was not difficult with so many great shops in the area. I took a few cards of the merchants myself to spread around! It was fun talkiing about the books and I think the people I met genuinely enjoyed it, too. Anyway, a little more challenging is approaching people at dinner, but my husband dared me to approach a table of six women, two tables over, who had finished their dinner and were passing an Ipad around while they chatted. I didn’t want to be rude, but, it was a dare…so, I took a few cards out of my purse, very nicely approached them and asked if they read books on the Ipad. Well, they did, and a very nice conversation ensued where I introduced myself and asked if they would like a card, and I explained a little about my book and the web site. They asked some questions about writing, which I was very happy to answer, then I quickly excused myself as to not be too intrusive. So, there you have it, Returning to the Scene of the Crime, or Promotion 101. A fun combination of work and play. And I’d like to send a special thank you out to all those people I spoke to for your interest in my work! Now for the Musa 1st Anniversary Blog Hop Giveaways! What is your promotional tip, or your favorite place to vacation? Leave a comment and you will be automatically entered to win a free download of Freefall in the eformat of your choice! Then hit the Musa Blog Hop Button below to continue on with the Hop and some other great giveaway opportunities, including Musa’s Grande Prize of a Kindle Fire! Click here to continue with the HOP! And we have a winner! Congratulations Catherine on winning a free e-copy of Freefall! And thanks to all of you for visiting my sight. I hope you enjoyed the hop. Until next time, Happy Reading! What a great blog hop so much fun thanks for taking part! Hi!! Happy Anniversary! Very awesome! Thanks for letting us celebrate with you! And thank you for the fun hop and giveaway!! Many blessings to you! Thanks all for your comments! Today is the last day of the hop. I will be announcing later who the winner of freefall is! And yes, my very favorite place to vacation is the beach, preferably the ocean. I love the outerbanks of North Carolina. Being in the Midwest, though, Door County is a good substitute. And I do like the idea of handing the cards out at libraries and books stores, etc. I think I’ll get right on that! The cards are a great idea for promotion. Have you thought about leaving some at libraries or bookstores? Or maybe giving some to friends so that they can give them to people they know who are readers. My favorite place to vacation is Florida. We stay at a very small hotel on Casey Key which is on the gulf coast. The hotel is on the beach and it’s very private. Not crowded and very relaxing. I could sit and watch the waves forever. I love that kind of low key promotion. I’m not an author, but I’m very much an introvert and know I would have trouble with doing that kind of self-promotion. It sounds like you handled it in a graceful way. Favorite place to vacation, any beach (I’m not particular) just love to walk in the sand as well as jump the waves. Great place to visit! Great book! Good luck! Fabulous advice for ebook promotion – thank you so much for sharing that! Wishing you continued success with your writing and thank you for the opportunity to gain another entry in the contest! Like the sound of your book, my husband keeps telling me we have to go vacation there, he has many happy memories of visiting there as a youngster.